With more than 20 years of experience as a STEM teacher and scientist, our new Umpqua Valley STEAM Hub director is ready to launch local efforts to expand students’ career-mindedness to new heights. 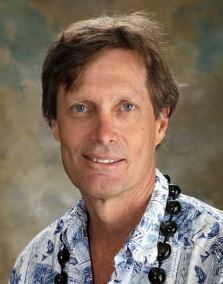 Dr. Karl Topper is joining Douglas County Partners for Student Success in June, coming all the way from the balmy climes of Hawaii, where he has spent the past several years teaching second through seventh grade at local schools. And yes, Topper admits, he will miss the beaches. But he’s also looking forward to diving into Douglas County’s growing STEAM community. Topper’s wife, Terri Squires, recently moved to Roseburg from Maui, and when he saw the opening for the STEAM hub, he jumped at the chance to share his bread th of knowledge with the community. Throughout his career, Topper has served as professor of Environmental Science and Teacher Education at Colorado Mesa University, where he directed programs working with a variety of Native American communities to help them develop culturally relevant environmental science education. He has taught at the K-12 level for the past 11 years, and has worked on a wide range of science field projects, written over 22 publications, acquired numerous grants, and provided many STEM-related professional development workshops for teachers. The efforts behind DCPSS and the Umpqua Valley STEAM Hub involve reinforcing students’ aptitudes for careers and educational paths that benefit from the knowledge and skills in disciplines that explore science, technology, engineering and math, with artful innovation. Ours was one of six regional hubs awarded a total of $2.8 million in state funds in February 2014. The Umpqua Valley STEAM Hub was awarded $325,000 to build a solid infrastructure to provide STEAM education in Douglas County. Topper said he plans to meet early on with community stakeholders to learn what types of STEAM programs and support that local school districts, nonprofit organizations and private businesses would like to see developed. He would like to then help create STEAM-related programs to enhance student learning and interests within STEAM-related fields, as well as facilitate collaboration with local businesses to help connect students with jobs. He also plans to pass on knowledge to teachers by providing STEAM professional development opportunities so that educators can integrate STEAM learning in their classrooms. Topper said that rapid changes in technology mean a rapidly changing workforce, and Douglas County needs to ensure students are prepared. The area’s rural nature, he said, makes it even more essential for the county to have a broad base of interested STEAM stakeholders working together. “When kids see a meaning to their learning, their intrinsic motivation to learn increases such that a struggling student can be transformed into an excelling student,” he said.